Bambury quilt cover sets are available at Elan Linen online bed linen store of Australia offering Bambury at 40% deal sale discount. You can also buy the bedspreads, sheets of other brands like like Bianca, Kas, Esprit Home and much more. Why choose Elan Linen for shopping Bambury bedding online? Memphis Quilt Cover Set by Bambury is a cheerful and modern design printed on very smooth cotton sateen fabric and finished with peach colored piping and features a navy dot pattern on the reverse side. 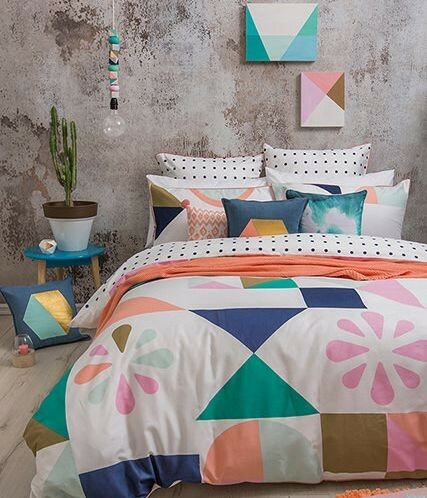 The big geometric shapes and bold contemporary colours on the front such as emerald, peach, pink, navy, blue and bronze give an abundance of fun styling options for Memphis Quilt Cover Set by Bambury. Following are the details of the sizes and attached items. You can buy this attractive Memphis Quilt Cover Set at Elan Linen online store. memphis quilt cover set by Bambury online Australia.